I've tried to write all these blog posts lately and I never seem to finish them. To be honest, I think it's because I just don't have the heart. I'm trying to be lighthearted and put on a good face and be upbeat, but it's just not there. 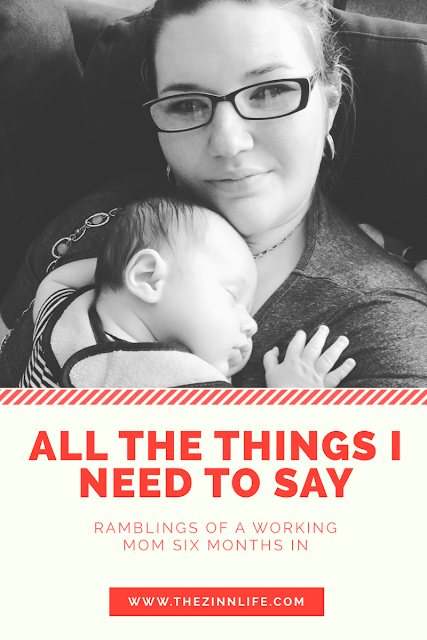 So here's all the things that I've been trying not to say, but I think I need to say. This is hard. Being a mom is hard. Being a working mom and keeping your ish together is freaking hard. This is nothing against a stay at home mom, our struggles are different, but I've accepted the fact that I'm losing the battle at keeping things together. I've been pumping full time, working full time, mom-ing full time and half you-know-what-ing the rest. I hate the term "little one." I can't say it, it makes me want to gag because I feel like someone completely not me when I say it and it makes me crazy. Maybe it's my hormones? I don't know. Daycare is not raising my kid. Someone said that to me while I was pregnant, that they wanted to stop working before they had children because they didn't want someone else raising their child. That's great that you feel that way. That you have the ability to do that, but not everyone does. Daycare isn't raising Carter. They are taking care of him and building on what he learns at home. We are his parents, we are raising him. I like that he's in daycare. I grew up in daycare. I wasn't traumatized, I don't need therapy. He gets to play with other kids, have other adults love on him. And he's going to have one amazing immune system when he's done. God did not make me to be a stay-at-home-mom and that's okay. I've always known that. Maternity leave just reinforced it. And it's okay. I'm still a good mom, I still love my baby more than anything. And I hope that growing up with a mom that works, that has a career that she's really good at, teaches him respect for strong women and to not be scared of them. Don't make a face at me when I tell you the above. You don't get it, it's cool. But I still love my baby and that's all you need to know. Breastfeeding is hard, full-time pumping is harder. I breastfed for two weeks and have pumped ever since. I've made it six months. In the beginning, two months was my goal and then I changed it to six. And, as only a mom will understand, while I'm almost completely weaned, there's still a part of me that feels bad for not continuing. Even though I know he's healthy and fine on formula and, honestly, has been more formula than not for a while, I still feel guilty for choosing me and my sanity over continuing to pump full time. Mom guilt is real. Period. I hate my postpartum body, but I hate it a little less every day. There are blogs out there about how women love their bodies because it gave life to their babies, but I'm going to be real and tell you that I hate this body. In a way, I'm in awe of it. It went through some crazy crap to have Carter. Pre-eclampsia, cardiac issues, etc. I'm still on blood pressure medication six months later. But I also hate it. I worked so, so hard to lose weight. To be okay with where I was and here I am, back at square one. I've slowly started to shed the remaining 20ish pounds, but it's slow going. And until then, I'm lumpy and feel about as unattractive as I can get. But each day, I make a little more progress and I hate it a little less. I sometimes don't know who I am anymore. I don't think there is enough talk about loss of identity when you have a baby. No one tells you that while you will love that baby more than anything, you'll also mourn a part of yourself. Some women grow up dreaming about being wives and mothers. That wasn't me. I wasn't even sure I wanted kids. I was, and still am, fiercely independent. Aaron and I were at the, "If it happens, great, if not, great" point. And in one fell swoop, two weeks early, my entire world changed. As the mom, you are the end all, be all. You no longer matter. This tiny person becomes your everything, your master. I taught my body how to go hours without eating or, alternatively, how to subsist on fruit snacks. I learned how to pee holding a screaming, wiggling baby. Your husband can help to a point, but there are some things he can't do. And he can't help what switched in you. My entire personality altered. When Carter screams, I literally feel like someone is pulling my heart out of my chest. I can't explain that to someone that has not birthed a baby. Now world events that have nothing to do with me freak me out in a way I can't explain. There are days that I honestly have no idea who I am. Carter is the best thing I've ever done. I say all of the above because it's true. And yet, despite all of those feelings, he is truly the best thing I've ever done. It's so fascinating to watch his little personality grow and change. To watch him learn how to do things. To find the parts of Aaron and I in him and the things that are all him. And that smile when he sees me in the morning or when I come home after work is the best part of every day. My cousin once posted that parenthood can be summed up as, "I can't wait to see who you become, but slow down a little." I've never heard truer words. We're all just trying to do the best by our kids. Social media is wrong - most moms feel your pain and want to help you. They don't want to judge you. They might not get you (see the part about not wanting to stay at home), but most moms just want to help. We've all survived those first few crazy, exhaustion blurred months. We've had people give us things and we want to pass those on to you (and clean out our houses). I've met some of the best women and have found rest and support from people in a way I never would have imagined since joining the mom club. At the same time, my secret favorite thing to do before bed is read all the comments on the Facebook click-bait baby, breast feeding and first-time-mom articles. Those women are crazy and I love it. It's a train wreck and makes me feel like a better person. It's okay to judge me for this. Being a mom is hard. Being a working mom is the hardest thing I've ever done. And I'm saying all these things on the off-chance that there's another mama out there that feels even one of them. Because everyone wants to say the nice, pretty things. But those don't help you when the walls are closing in. And they do, I've felt them more than once. But they also open back up and you find your footing. I've found that this crazy, exhausting time is one big paradox. Because while it's the hardest thing I've ever done, it's also the best. And for every time I think I'm going to lose it, I'm given at least three more reason why I'm not. You've got this mama. And, if you don't, go read some click-bait article comments. You'll feel a lot better. You're amazing, love the hell out of this blog!!! So proud of you. I remember telling my sister when Little was 2 weeks old about how nothing prepares you fully for this role and it is so identity shifting. And it is incredibly difficult to wear so many hats. And pumping is so hard. And mom guilt is real. And no one has it together all of the time. You are rocking it, Sarah. Thanks ML. I still remember our conversation at the Southern Women's show two years ago and how honest you were with me about being a mom, how it was wonderful and hard and to take my time. Your honesty, and not just the usual "it's the best thing ever, you should do it!" meant so much to me. You're doing a great job! I remember crying to my husband every evening after work that I felt like I was watching my son grow up in pictures instead of in person because he was at daycare, and I told him I felt like someone else was raising my child. But I think I was feeling that way because I had such a short maternity leave (6 weeks - NOT enough time) and felt like I was missing out on bonding with my baby. Now that he's almost 1.5 years old, I'm so glad he's back in daycare because they're going to teach him so much more than I can right now. They're professionals! And that's why it takes a village. I know it's been said a thousand times before, but the most important thing is to do what's right for your family, no matter what that looks like. It does get easier (and harder at the same time, ha!) but you're so right: it's hard being a mom!